Congratulations to the Ketchikan High School Lady Kings for winning and taking 1st place in Southeast’s 4A volleyball tournament. It was a battle. Juneau-Douglas High School tied the sets at 2-2 to force a fifth and decisive set. Ketchikan fought and won the last set 15-9 to claim the championship. Juneau-Douglas had won the previous 21 Southeast volleyball championships. The Lady Kings head to Anchorage this week for the state tournament. Hard work and team effort pays off. Congratulations again and good luck in Anchorage. 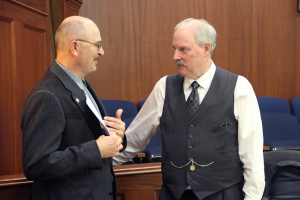 The third special session ended today with the Alaska State Legislature approving Governor Walker’s bill to fund the cash buyout of pipeline company TransCanada’s interest in the project. The State of Alaska will now have a full 25% interest in the project. I voted to buy back Alaska’s share in the project held by TransCanada so the state could return to being a full and equal partner. The buyout gives us a full 25% interest in the project, just like the other three partners: Conoco Phillips, BP, ExxonMobil. There is tremendous value in becoming an equal partner. First, it gives Alaska equal voting rights as a full and equal partner to negotiate and decide key issues for the project such as budgets, schedules, pipeline size, and selling gas. I cannot stress enough how important this is to protect our interests. Second, the buyout means an increase of as much as $400 million a year in additional annual revenue to Alaska from the gas line. I not only supported the cash buyout of TransCanada, I supported tapping savings to fund our portion of the project. We have the ability to pay cash. There is no need to borrow to pay the cost of the buyout and pay interest for years. In the end, Alaska’s position is much stronger, we eliminate the obligation to use TransCanada like a bank and pay interest for work that has to be done no matter what, and we get a much larger return once the project starts producing gas for sale. This is simply the best thing to do for the project and for the state.